I must confess that I was inspired to write this post because of a very in-passing post published to the wonderful ALAINFINKIELKRAUTROCK blog. Alas, my inspiration did not come from some higher power, foretelling dream, or anything of that variety. Regardless, I think this is a good one... and something pretty unusual. "Balearic" is a term that's often tossed around these days, but neither the word's users nor its recipients seem to really get what the heck the term means. (No, dofus―saying "it refers to the Balearic Islands of Spain" doesn't count!) Just about everyone in the cosmic disco or kraut worlds seem to have been, at some point, dubbed Balearic because of their penchant for utilizing atmospheric synth and guitar washes that mimic the soothing, subdued ebb and tide of a placid evening beach scene you might find in Spain (or, for that matter, on an episode of Bay Watch). Yes, despite the fact that high-brow innovators like Hatchback, Sorcerer, Lindstrøm, Prins Thomas, and so many others have been categorized as being of the Balearic breed, none of them exude the innate cheesiness that the word traditionally embodies. Anyway... let's get back on track here! Sometimes the best way to understand what's going on in today's world is to look to the innovators of the past and understand what they were up to, thereby awakening yourself to the realities of today. I won't attempt to delve into the studies of Balearic disco or anything of that variety (I can hardly profess to know anything! ), but I will point you in a compelling direction: Double Fantasy. The 80s duo (comprised of Charly McLion and Robert Schröder) specialized in playing incredibly chill, wafting jams that absently, easily drift off into the sunset from whence they came. When you listen to their stuff, time either stands still entirely... or it passes at a syrupy-slow rate (one hour becomes five). Schröder, a German-born guitarist, was behind a number of pre-Double Fantasy projects through the 70s, but it wasn't until he met Tangerine Dream's Klaus Schulze that he finally readied himself to, eventually, become a part of D.F. Schröder, both a guitar geek and electronics nerd, seemed an obvious signee to Innovative Communications as he represented the middle ground between the mind-bendingly meandering works of Tangerine Dream and the more robotic experiments of numerous 80s electronic musicians. 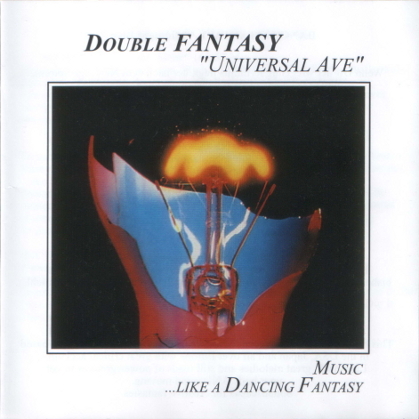 Schröder and McLion put out two Double Fantasy LP's (Universal Ave. and Food For Fantasy) before breaking up. McLion seems to be currently doing stuff under his own name (investigate with caution, please) while Schröder appears to be attempting to revive the D.F. brand under the moniker Food For Fantasy. Allegedly, his new solo work is reminiscent of the Universal material. We shall see. Since I don't care much for Food For Fantasy I give you three jams from LP1. Maybe this will shed some light on what exactly folks are talking about when they go into some unwarented, confusing Balearic spiel.